SSC CHSL Descriptive Paper Syllabus 2019 Previous Year 2015,2018 LDC DEO 10+2 Typing Test Sample Question Papers News SSC CHSL LDC DEO Descriptive Paper Syllabus 2018. SSC CHSL PA SA LDC Skill Test Syllabus Pattern - It is of qualifying nature. Candidates should posses Data Entry Speed of 8,000 key depressions per hour on computer. 2) Application Letter writing of up to 150 to 200 words. 1) The Kiran Publishers, Arihant and Banking Chronicles Book is written. 2) You Should Prepare 5 Year Practice Book, that contains in English and Hindi 10 Practice Sets. 3) Descriptive Paper Book is sold in Snap Deal, Flipkart and Amazon at Rs 200 to 300. 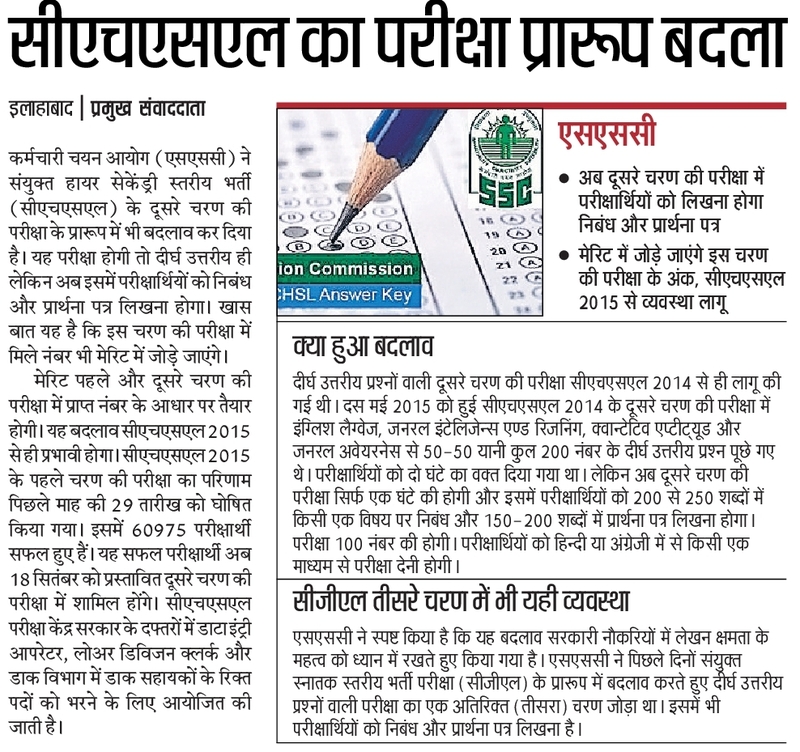 SSC CHSL Typing Test Syllabus 2019: Staff Selection Commission conducted the Combined Higher Secondary (10+2) Examination (Descriptive paper) for recruitment to the post of Data Entry Operators and Lower Division Clerks at various centres all over country. Based on the cut off fixed in Paper-I and qualifying marks in Descriptive Paper (Paper-II) by the Commission, 6728 candidates qualified provisionally for skill test for Data Entry Operator and 44634 candidates for Typing Test for Lower Division Clerk. SSC CHSL Exam preparation tips in Hindi Pattern subject wise contains 50 questions each. You will be shortlisted for the performance test on the basis of their skill in the written test 1ST General Intelligence Awareness, 2nd English Language, 3rd Basic Knowledge and 4th Quantitative Aptitude, Basic Arithmetic Skill. Paper called General Intelligence & reasoning. Ability SSC CHSL Paper Syllabus same as in but with slightly higher level in comparison of 6SSC CHSL PA SA Recruitment 2018 to always comes from previous year model paper pattern on Quant’s that from Arithmetical and Numerical Abilities, there will be questions on data interpretation & Analysis. 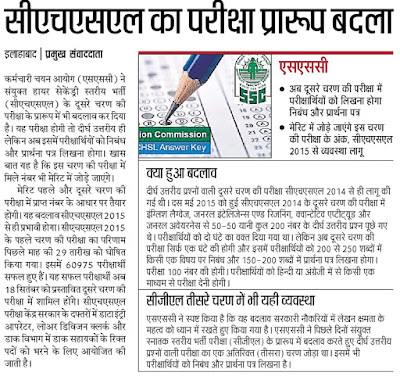 And at last you will get date of joining and appointment letter based on position in the SSC CHSL Merit List . SSC CHSL Descriptive Paper in English language : Expansion of Ideas candidate will be required to elaborate their ideas on specific quotes, topics SSC CHSL Descriptive Topics on current affairs of National and International interests, culture, society, women empowerment, environment, Relation with neighboring countries, etc. 2. Descriptive test from SSC CHSL will have a descriptive written paper. It would include questions of both verbal and non-verbal Type. The test will include questions on Semantic Analogy, Symbolic operations, Symbolic/Number Analogy, Trends, Figural Analogy, Space Orientation, Semantic Classification, Venn Diagrams, Symbolic/Number Classification, Drawing inferences, Figural Classification, Punched hole/pattern-folding & unfolding, Semantic Series, Figural Pattern – folding and completion, Number Series, Embedded figures, Figural Series, Critical Thinking, Problem Solving, Emotional Intelligence, Word Building, Social Intelligence, Coding and de-coding, other sub-topics, if any Numerical operations. SSC CHSL English Language Important questions: Spot the Error, Fill in the Blanks, Synonyms/Homonyms, Antonyms, Spellings/ Detecting Miss-spelt words, Idioms & Phrases, One word substitution, Improvement of Sentences, Active/Passive Voice of Verbs, Conversion into Direct/Indirect narration, Shuffling of Sentence parts, Shuffling of Sentences in a passage, Cloze Passage, Comprehension Passage. Percentages, Ratio and Proportion, Square roots, Averages, Interest (Simple and Compound), Profit and Loss, Discount, Partnership Business, Mixture and Allegation, Time and distance, Time and work. Basic algebraic identities of School Algebra and Elementary surds (simple Problems) and Graphs of Linear Equations. ssc chsl descriptive paper cut off marks 2016 SSC CHSL Syllabus 2016 tier 1 2 new exam pattern 2015 cgl question paper SSC CHSL Descriptive Paper Syllabus 2016 for lower division clerk as LDC and data entry operator DEO Exam of 10+2 shortlisted candidates to give descriptive paper on 2016.